The Celebrity Summit is the perfect ship for those looking for a weekend getaway or a short vacation on board a luxury cruise ship. After having recently undergone a major makeover, the Celebrity Summit offers the top of the line in modern luxury cruising. This world-class ship sails primarily from U.S. East Coast ports to tropical destinations like Bermuda and the Caribbean. Specializing in short cruises, the Celebrity Summit is perfect for a weekend getaway or short escape. It’s also ideal for first-time cruisers who want to try out this style of traveling first before committing to a longer trip. Whatever your reason for cruising, the Celebrity Summit is sure to impress with its modern furnishings, attention to detail and famous level of service. 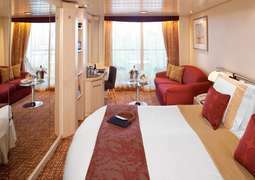 The recently refurbished staterooms on the Celebrity Summit are designed to provide the highest level of comfort to guests of refined taste. 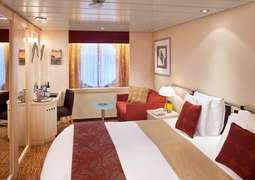 Notoriously spacious and highly personalized, Celebrity staterooms come with complimentary robes, 24-hour room service, and exceptionally high-quality bath products and bedding. 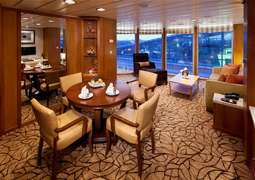 Guests who book suites will also have access to special privileges such as priority seating at the on-board theater, dining at the exclusive Luminae restaurant and a personal butler. A favorite among foodies, Celebrity cruises are known for the high-quality cuisine on their onboard restaurants. The Celebrity Equinox is home to the famous Qsine, an experimental, modern restaurant offering new takes on classic dishes. Try a classic Ngiri sushi served on a stick as a lollipop, or an unusual combination such as lobster and escargot. For those with more traditional tastes, there are seven other restaurants to choose from, ranging from gourmet Italian to casual cafes. Celebrity cruise ships cater to a clientele of sophisticated adults. In addition to classic cruise ship amenities such as a swimming pool, sun decks and a dance club, a variety of health and wellness activities are guaranteed to keep cruise guests looking and feeling their best. Indulge in spa classics such as a relaxing facial or aromatherapy massage, or in more therapeutic treatments like acupuncture or a skin peel. The Celebrity Summit is also a good choice for fitness-conscious cruisers, with an on-board fitness studio and a variety of aerobics classes lead by experienced trainers. A casual dress code reigns supreme on the Celebrity Summit, with the restaurants in the evenings encouraging a “smart casual” or, once a week, an “evening chic” look. Smart casual can include long pants or a shirt paired with a casual top, while on Evening Chic nights, men are asked to wear designer jeans or pants with a button shirt (sport jacket optional), and women should wear a dress, skirt or pants with a formal top. Guests who choose to go above and beyond are welcome to dress black-tie for dinner, but this is not required. Celebrity Summit is a cruise ship owned and operated by a global cruise line Celebrity Cruises. A millennium-class cruise ship was built in 2001 by the Chantiers de l’Atlantique shipyard in St. Nazaire, France. Exquisitely glamorous and elegant vessel is the third of the Millennium-class Celebrity cruise ships. Experience every modern comfort available along with a variety of sports activities, leisure facilities and enjoy the spaces that have welcomed guests back time and time again. Some spectacular destinations of the Summit include Canada and New England. Based in Cape Liberty port, her normal cruise track finds her wintering in the southern Caribbean and summering at Bermuda. Dining on the Celebrity Summit is not just a daily ritual, it is an experience that defines this incredible ocean liner. Guests are treated to exquisitely produced meals in its stunning range of restaurants. The Normandie is bright and welcoming French and American restaurant that offers Champagne High Tea and Demonstration Kitchen for live cooking shows. The popular Cosmopolitan Restaurant is not just a great eatery, but it also is a memorable dining experience by any standards. Celebrity Summit has numerous dining establishments in which you can sample, including; Mast Bar, Waterfall Café and AquaSpa Café. The atmosphere onboard is calm and sophisticated. Celebrity Summit offers her guests a wide variety of activities, amenities, and entertainment, accommodating all ages and preferences. From the Summit’s gorgeous and thought-provoking Art gallery, Celebrity Theater with dazzling special effects and Broadway-style productions, restaurants and tranquil spots for socializing, the onboard experience is awe-inspiring. Little ones can visit the Video Games Arcade or hang out in the X-Club with the dance club and coffee lounge designed with them in mind. 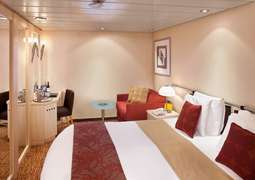 Let Dreamlines arrange the trip of a life-time on the stunning Celebrity Summit, and the cost might just surprise you! Call today on 1 888-665-8208 to talk through with our cruise experts!